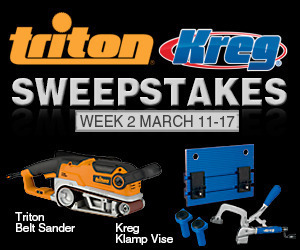 If you hadn’t heard already Kreg Tools and Triton Tools USA have teamed up in the month of March to do a big giveaway each week. Triton Belt Sander (TA1200BS) – a versatile sanding powerhouse with a 3″×21″ belt and variable speed. Kreg Klamp Vise (KKS1060) – the solution for adding a vise to almost any bench or work surface. Remember, only persons residing in the United States who are at least 18 years of age can enter and this prize package is up for grabs March 11-17, 2013.